I had a really good laugh when a friend tagged me in a link to an article by The Star about the so-called 'Get Smart' Pills. If you didn't know, some school headmasters & teachers have been forcing their pupils to buy these pills. They claim that these pills have a concentration of herbs which make pupils more obedient & hard-working. These pills were apparently also endorsed by the Malaysian Federation of the Council of Headmasters. If that is the case, the credibility of this organisation is in question. Especially since lab tests have found that the pills were 95% sugar & less than 2% herbs. Shockingly, these herbal candies have been in distribution since 2010. It might have had a placebo effect on the pupils. 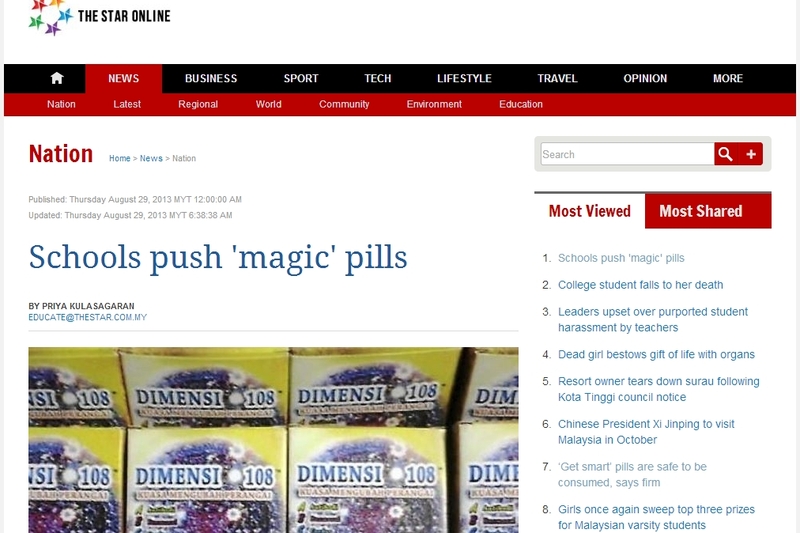 Anyway, I laughed about the article because it reminded me of a particular 'Pill Pandai' pusher at my school. No, it was not a teacher. It was actually one of my Form 2 students. Let me call him AB. A primary schoolmate of his divulged the story. When AB was in Year 6, he would go around the hostel asking the other pupils, "Siapa nak pandai? Kamu nak jadi pandai tak? Makan pill ini. Kamu akan jadi pandai." And business was booming until the wardens discovered the scam & shut it down. They found out that he was actually selling Vitamin C tablets as "Pill Pandai" for RM1 per tablet. Genius. The irony was he was really short, he didn't have the most charming face, and he was really weak academically. We never expected this kid to have the potential to be a major swindler slash successful businessman. It's amazing what people can come up with & what people will believe. (Reminds me of how Apple swindled the world.) I guess we should never underestimate our students. Who knows, he might be paying my salary in the future.